We're So Excited to Have You Here! We offer several options for exhibitor hospitality during our show each year. Click the drop-downs below to learn more! Limited availability! Join us ringside in the Committee Stand for the best up-close view of the Dixon Oval performances. Offered 9:00 a.m. – 4:00 p.m. daily throughout the show, the Committee Stand tables are the height of exclusive private entertainment at Devon. 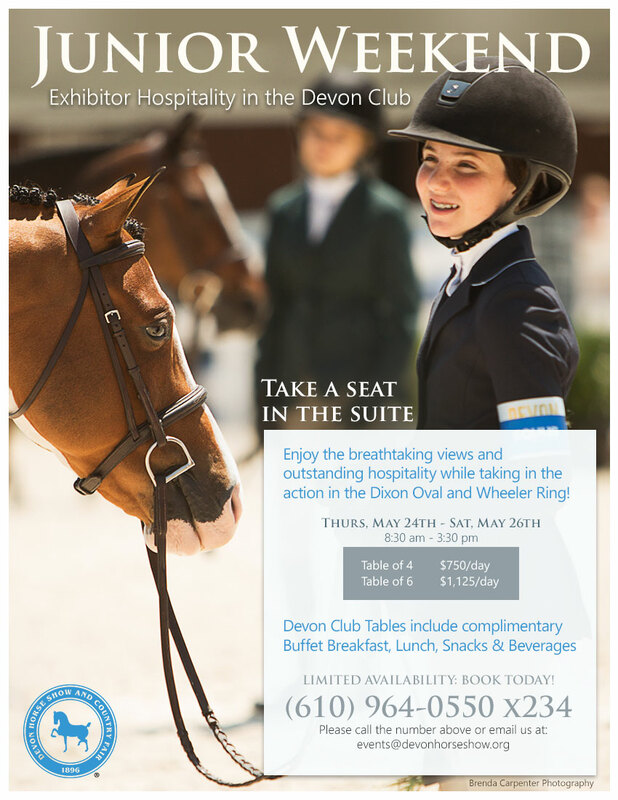 Email events@devonhorseshow.org to inquire about availability. Anyone displaying an exhibitors’ wristband is welcome! The lounge, located under the East 3 Grandstand, will offer hot and cold drinks, snacks, and small bites. Amenities of the lounge include not only A/C, but WiFi, a message center, charging stations and closed circuit TVs that will allow exhibitors to keep an eye on the ring while unwinding. The exhibitors’ lounge will be open 8:00 a.m. – 6:00 p.m. each day of the show. The Exhibitors Hospitality room, located underneath the South Grandstand, is open to all exhibitors, trainers, and owners – Age 21 and over. Cocktails and great lite fare is served at no charge with your exhibitor wristband! Please present your wristband at the door. Dress code is riding attire or comfy casual. If you wish to bring a guest, the charge is $30 except for Grand Prix night which is $40. Age 21 and over ONLY! The Hospitality Room is open nightly from 5:00 p.m. – 7:00 p.m., Saturday, May 26th through Saturday, June 2nd.